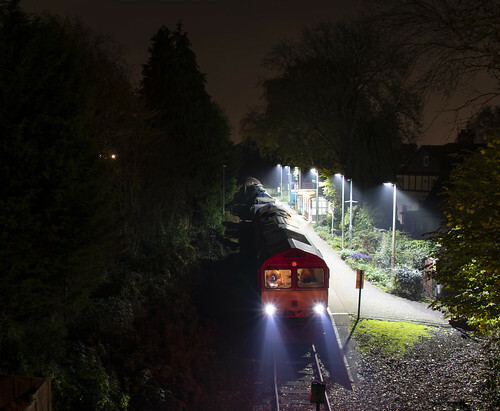 Class 66 locomotive 66115 stands at the end of the Coryton branch on 5th November 2018 with the nightly Margam-based railhead treatment train. A fellow class member is on the other end of the train which will shortly return to Heath Junction. Its journey from there takes its north along the Rhymney Valley Line as far as Pontlottyn before returning to Margam via Cardiff and a trip along the Maesteg branch. Sandwiched in between the locos can be seen the water tanks and associated equipment which jet water at extremely high pressure on to the railhead in order to remove lead mulch and thus improve adhesion during the autumn season. A photo of the train with the jet working can be seen here: www.flickr.com/photos/126337928@N05/37829114752/in/photol... . Especially on a misty night such as tonight, these trains have a ghostly feel with the water spray surrounding the train, and the locomotives covered in grime dislodged from the railhead.